Dem Bones! 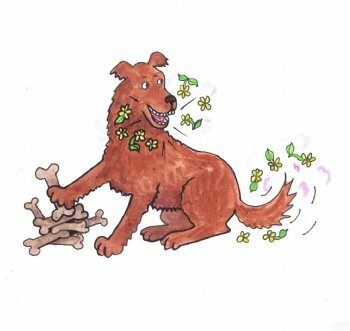 are a completely natural treat for dogs containing effective levels of charcoal and herbs to help clean teeth, freshen bad breath and 'eliminate' bad instances of dog gas!! Available in 500g packs. You can earn 4 PawPoints on this product! Dem Bones! are a Natural Complementary Treat for Dogs Containing Rice, Corn, Potato, Oats, Chicken Oil, Brewers Yeast, Sugar Beet Pulp, Cellulose, Parsley (2%), Seaweed Meal, Fish Oil, Activated Charcoal, Yucca Extract, Prebiotic FOS Typical Analysis: Crude Protein 8% Oil 6% Fibre 6% Ash 6% 352kcals/100g * Hypo-allergenic – no wheat gluten, dairy products, beef or soya * 100% natural – free from artificial colours, flavourings or preservatives * Great for digestion (flatulence, bad breath, upset tummies) and teeth * Low fat – low calories * Suitable for vegetarian diets Feeding Instructions:- CSJ ‘Dem Bones’ can be fed anytime as a treat. Small Dogs: Suggest feeding in halves up to 4 per day Medium Dogs: Feed up to 5 per day Large Dogs: Feed up to 10 per day Will be available in 500g. "Have a great crunch which he loves"
Review: I thought I would give these a try rather than buying dentastick type chews for Rufus as looked much healthier! Pleased to say he's loving them! A very happy Rufus who keeps following me into the kitchen on the hope I get him a Dem Bone out the box!! Review: These were so popular that Mylo set up camp next to the treat drawer. Will definitely be re-ordering!! Deliveries are made to UK addresses only. Overseas customers should contact their local CSJ stockist. Please allow 5 full working days from ordering. Items marked as 'Free Shipping' (eg Herbs, treats, etc.) are sent by 2nd Class Royal Mail post, and do not affect the weight of the 15 - 30kg food orders, that are shipped by courier. You can now earn PawPoints when spending in our online shop. Earn 250 PawPoints for writing a Product Review (subject to approval). See our help page for more information about using and earning PawPoints.